Emmanuel Macron Thanks Australian PM Malcolm Turnbull's "Delicious Wife"
Emmanuel Macron and Malcolm Turnbull navigated their way through several sensitive diplomatic issues at a news conference in Sydney on Wednesday. 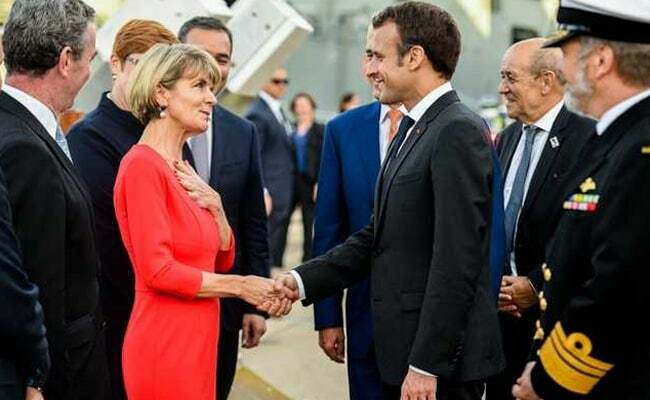 Sydney: France's President Emmanuel Macron may have had le vin rouge on his mind when he thanked Australian Prime Minister Malcolm Turnbull and his "delicious wife" for their warm welcome on his official visit. Macron and Turnbull had navigated their way through several sensitive diplomatic issues at a news conference in Sydney on Wednesday, only for the president to make the lingual slip while making closing remarks in English. He thanked Turnbull and his wife, Lucy, for being good hosts and acknowledged the fine food and wine he had enjoyed on his visit, before exclaiming: "I want to thank you for your welcome, you and your delicious wife for the warm welcome." The comment lit up social media, replacing discussion around the leaders' deliberations on more weighty issues such as China's growing influence in the region. But what exactly did Macron try to say? Sydney-based translator Ian Davies told Reuters he doubted Macron had made a straight translation faux pas because a French speaker would never use the French word d&#233;licieux to describe a person. "Presumably he meant she was delightful," Davies said. "You say d&#233;licieux about a patisserie not a person." It is not the first time a stray comment - in this case, unintentional - on a high-profile visit has overshadowed more official business. Last year, US President Donald Trump praised French first lady Brigitte Macron for being in "such good shape" on a state visit to France.